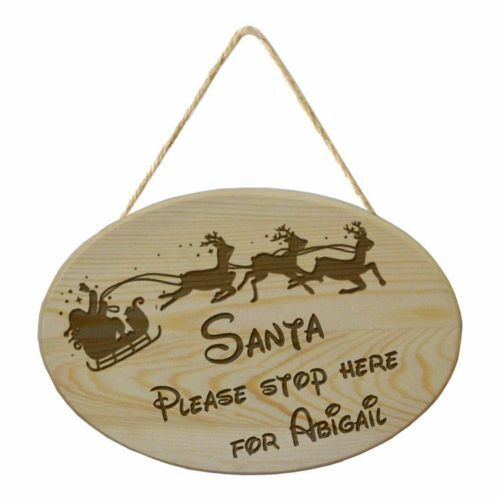 This quality wooden oval Christmas plaque can be personalised with any Child's name for them to hang this Christmas..
Made from rubberwood and attached with rustic rope this hanging plaque has an image of a sleigh and reindeer across the top and underneath the wording 'Santa please stop here for (Child's Name)'. It is light enough for use with fixings like suction cup hooks allowing it to be hung from surfaces such as glass doors and windows. Indoor use only. For engraving we can add names to this plaque. This edition consists of a beautifully detailed laser engraved stack of Christmas presents on the back panel, with your personalised engraving on the front side, resulting in a stylish 3D effect. This edition consists of a beautifully detailed laser engraved snowman on the back panel, with your personalised engraving on the front side, resulting in a stylish 3D effect. This quality wooden square Christmas plaque can be personalised with any Child's name for them to hang this Christmas..